Sports enthusiasts from the University of Wisconsin-Whitewater give their take on anything and everything in the sports world. From the NBA, NFL, MLB, UFC and even the WWE...nothing is off limits for these fanatics. Tune in Monday-Thursday from 5-6 to hear HawkTalk on 91.7 The Edge WSUW Whitewater, or watch the simulcast on UWW-TV. As most weeks in the NFL playoffs go, the people of the sporting world have all week to talk about football with a limited number of teams to talk about. 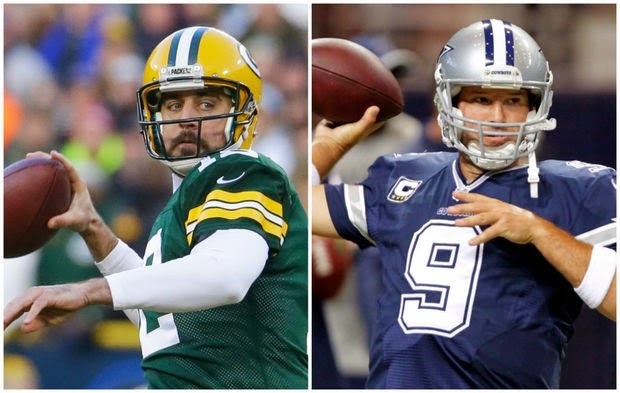 This week a lot of the talk has turned to the Packers vs. the Cowboys. More specifically Tony Romo and Aaron Rodgers. Other than leading their teams to the playoffs what do they have in common? Well Tony Romo was almost picked up in by the Packers. Think about that. Tony Romo as the Packer's quarterback and not Aaron Rodgers. If Tony was picked up in 2003 there would be no need to draft Aaron 2 years later. Tony would be the successor and Aaron would be making some other team in the NFL look outstanding. There is so much more to this game though than just these quarterbacks. Think back to the 1967 NFC Championship game. The Ice Bowl. The game that is forever known for being the coldest game in NFL history. The game that sealed the identity of the Superbowl trophy. Bet you didn't think about that. If you think about it, if the Cowboys hold the Packers at the goal line and prevent them from scoring, then Tom Landry and the Cowboys most likely go on to win the Superbowl that year. The there is an outside chance that the Lombardi trophy is named the Landry trophy. Again this is a big if, but still it could have happened. Now back to this weekends game. Who really has more to prove? The Packers? Well Mike McCarthy and Ted Thompson are trying to prove to the organization that their way of drafting stars and not acquiring them via free agency is the best. Aaron Rodgers is still trying to get over the Brett Favre hump and silence the rest of the haters in Packer land. He is trying to prove that he is the best weapon for the Packers. Jerry Jones and the Cowboys are trying to keep their "America's team" name that they've had since the 90s. They haven't done much since then and it is starting to look like, that if Jason Garrett doesn't lead this team to victory that he could be looking for a new job this postseason. Tony is trying to prove that he can win playoff games, and that last week's win over the Lions was not a fluke. He is trying to get rid of his non clutch nature.